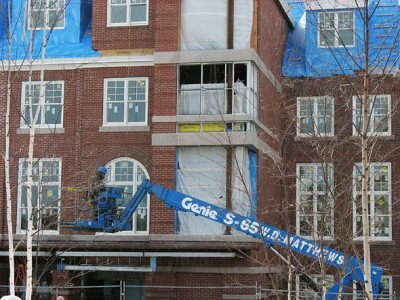 Captivated by the details of steel, drywall and bricks, as we often are, it’s easy to lose sight of the fact that the renovation of Hedge and Roger Williams halls is not actually the most important activity involving these buildings. What really matters, of course, is what people do in a building during those long intervals between construction projects. We were reminded of this truth by Ken ’45 and Muriel Baldwin of Cornwall, Pa. The Baldwins, donors to the Roger Williams project, may have a genuinely unique perspective on the Bill. Ken lived there as a freshman in 1941-42, and Muriel took a job there as secretary to bursar Norm Ross ’22 in 1946, when Ken resumed his studies after World War II military service. Read the Baldwins’ story. As glassy as Hedge and Roger Williams halls are these days, there is still plenty of pane to come. 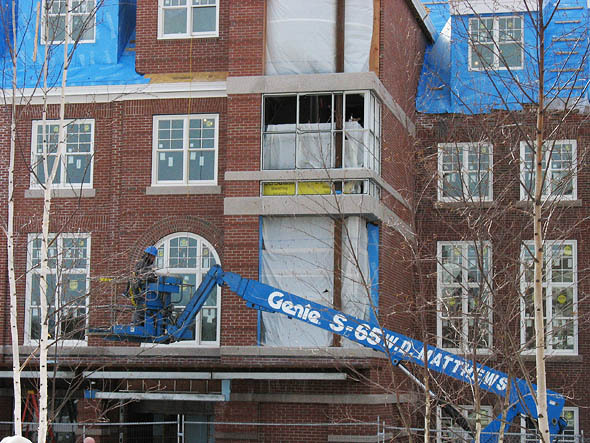 At Hedge, the big siliceous excitement is on the Alumni Walk side, as workers are installing the glass walls — aka “storefront” — on the four-story stair tower. Particularly at night, this feature will bring welcome light and liveliness to what has been a dark stretch of the walk. Similarly, the Bill will have a much larger glass box connecting its old and new sections, and installation of that storefront will likely begin by March. Also at Hedge, the missing windows in the distinctive old turret will soon be set in, now that brick has been ground down to adjust their fit. Masonry affected a window installation at Roger Bill, too. If you thought you saw a big bay window in place one day but sitting on the ground the next, you weren’t traveling backward through time: the unit was removed so the granite sill could be ground down for a better fit. Abandoning glass but remaining in the realm of substances you don’t want to chew, Farnsworth reports that the bathroom tiles — nice big subway tiles, white on the walls and dark on the floors — are installed in the ground floor at Hedge, and the tilers are moving upstairs. 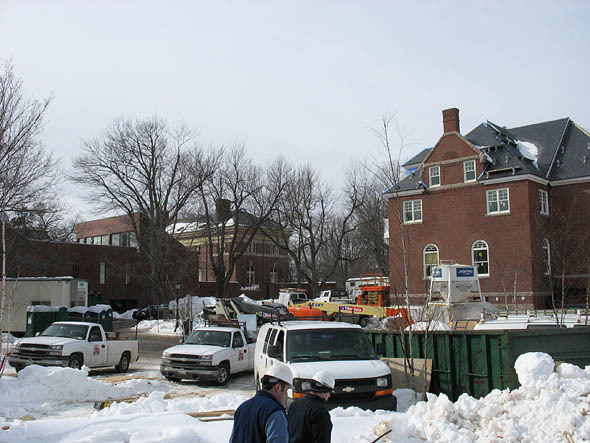 As we segue neatly from bathroom tiles to water (sometimes the writing just flows like Jack Kerouac doing On the Road), Farnsworth notes that workers have begun installing solar panels on Hedge’s roof that will supplement the hot water supply for the building. Similar panels will be mounted on the Bill’s roof, too, at a time still undetermined. The panels are among the features that will contribute to the buildings’ high energy efficiency, a centerpiece of Bates’ facilities management. Let’s end the Hedge news with a nicely symbolic development: the installation of projection screens in the building’s three classrooms. 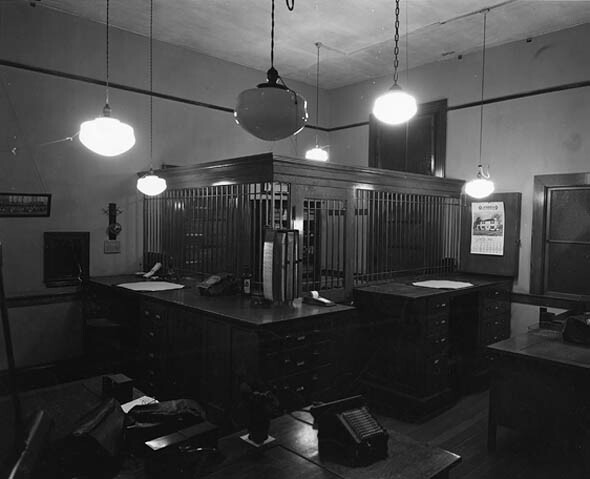 The heavy screens, which live in the ceiling and open downward at the push of a button, needed to be hung before the ceiling grid can go up. What makes it a milestone is that the screens are the first features directly tied to teaching that have been installed since the buildings’ conversion from residential to academic space began. Back at the Bill, Farnsworth reports that the main stairs — climbing the dramatic four-story well that Ken Baldwin’s nemeses once used for water bombs — are complete and in use, offering welcome relief to ladder-weary workers. 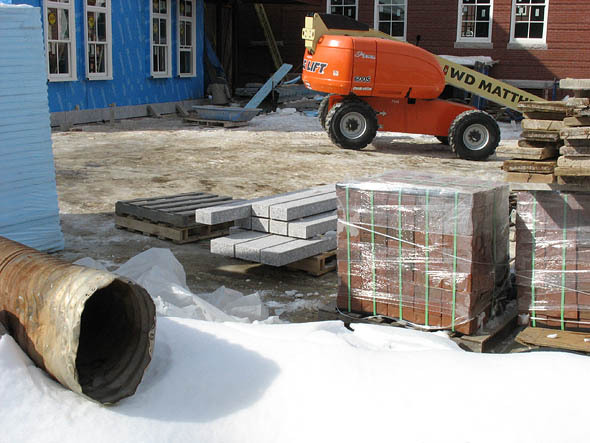 And expect to see scaffolding rise around the new addition in the coming days, followed by plastic sheeting that will hold in heat and allow masons to do their work. In fact, they’ve already started, laying a course of granite around the base of the addition. Once the staging is in place, it will be granite and bricks all the way. 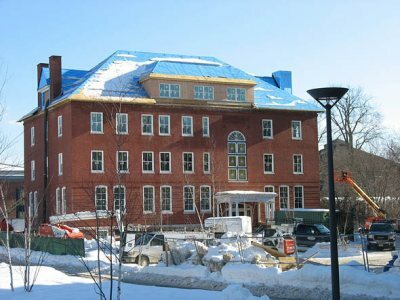 All bricked up, too, will be the faux chimneys overlooking the Library Quad that now look rather naked and defenseless in their Blueskin underwear. Can we talk? Campus Construction Update welcomes your questions, reminiscences and comments about campus improvements. Please e-mail Doug Hubley, stating “Construction Update” in the subject line.